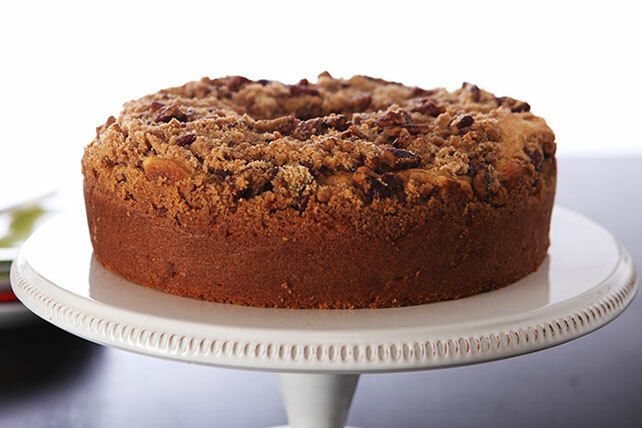 Find two tart apples to give our yummy Apple Streusel Coffee Cake its big apple flavor. You'll love this Apple Streusel Coffee Cake any time of the day! Microwave apples in microwaveable bowl on HIGH 1 min. or until crisp-tender; drain. Cool. Meanwhile, mix 1/2 cup flour, brown sugar and cinnamon in medium bowl. Cut in 1/4 cup cold butter with pastry blender or 2 knives until mixture resembles coarse crumbs. Stir in nuts. Mix remaining flour, baking powder and baking soda. Beat 1/2 cup softened butter and granulated sugar in large bowl with mixer until light and fluffy. Blend in eggs and vanilla. Add flour mixture alternately with sour cream, beating until blended after each addition. Stir in apples. Pour into greased and floured 10-inch tube pan or 12-cup fluted tube pan. Sprinkle with nut mixture. Bake 50 to 60 min. or until toothpick inserted near center comes out clean. Cool in pan 10 min. Loosen cake from side of pan with knife. Invert cake onto wire rack; gently remove pan. Cool cake completely. At 16 servings, this tasty recipe makes a great cake to serve at your next holiday party. If using a tube pan with removable bottom, run a thin knife or spatula around edge of pan to loosen cooled cake from side of pan. Remove side of pan. Run a knife or spatula along the bottom edge of pan to remove the cake from the pan base.